When integrating Operate and Ezeep, you will have the possibility to provide your customers with cloud printing services which they can use across your organization. Ezeep Credits allow you to provide customers with a limited number of free pages to print per month. The integration works for both residential and non-residential customers. To learn more about configuring the Ezeep to Operate integration, please read Configuring the Ezeep Cloud Printing Integration within essensys Operate. All Ezeep related credits and charges are applied per Account. You can allocate a number of print credits to a customer, via their Operate Account Page, and as long as their print jobs go through an Ezeep enabled printer, then they will be automatically charged in Operate or credits will be deducted if available. If a customer's Account record contains a number of allocated pages then a Licence is activated for this Account within which the number of allocated pages is updated, then this updated information will be added to the Account record as well. For example: An account has 10 free Black or Color prints per month > A licence allocates 20 Black or Color prints then gets activated > The Account record will update to allocate 20 Black or Color Prints. The same happens in reverse: If the Account record is updated, the Licence will update as well. If a customer activates a second/third.. etc Licence and the number of pages is updated, then this update will affect the Account record as well as all pre-existing Licences. If there is more than one Account record with the same contact email address, then updates made to the number of allocated pages on one of these Account records or on any activated Licence under any of these Account records, then the number of allocated pages will update on all Account records with the same email address and all Licences under all of these Accounts. If a Contact with the same email address is assigned to multiple Accounts and therefore Locations, Ezeep will only pick up this contact once, regardless of how many accounts it is associated to and how many Licences those Accounts have together. This is due to the assumption that a particular person is associated to a particular business, which receives printing services across your entire organization. This enables Ezeep and Operate to charge your customers correctly, no matter which of your buindings someone might decide to print at. What this means is that one client receives one package of allocated free pages (credits), no matter whether they are residents of one or more of your buildings. The staff of this client will consume from the same package of allocated pages, no matter how many times a contact person or an Account record is added within Operate. This is important, considering the fact that Operate requires you to create a new Account for the same customer, but who rents space within another building and associate all records belonging to the same customer to a Group Account. So the integration behaves AS IF you would allocate per Group Account, not per Account record, even though the latter IS actually the case - regardless of whether you have created a Group Account for the Account records in question. Due to these interdependencies, we do not recommend providing different amounts of allocated free pages in different contracts signed with the same customer. Rather, the first Licence could stipulate the fact that free prints will be the same across all contracts, and are subject to subsequently agreed changes, as part of any future licences. Access the Settings, go to General > Customize > Accounts > Page Layouts. 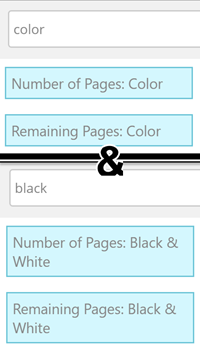 Once you save these on the Account record, you can edit the Number of Pages: Black & White and the Number of Pages: Color fields. The fields related to remaining pages are only visible in view mode and cannot be edited, since they are automatically calculated based on the customer's use, through Ezeep. If you would like to include free prints as part of a Licence Agreement, you can add them when creating the Licence. Under the Ezeep Printing section, you can allocate a number of black and white and color pages, which will update across all of the customer's Accounts and Licences, as explained above. This update will only occur once the Licence is activated. If either the Account record or one of its associated Licences is updated with a number of allocated pages that is less than the previous allocation, then there is a very slight window within which prints may not be charged for. If someone prints while your change is being made, but the print job has gone through while the previous allocation was in place, the customer will be able to pick up the print at no charge, because the print command has been passed to Ezeep before the change was made in Operate. If you ever need to troubleshoot any prints that have not been charged for, the easiest way is to look at the Account record audit trail (On the record, click Actions > See Events) - where the change in Operate should have been tracked. You can then compare the time of the change to the time of the print and find out whether this has been the reason why it has not been charged for. First, your Ezeep to Operate integration needs to have been configured, as explained in Configuring the Ezeep Cloud Printing Integration within essensys Operate, which also explains these requiremenets in context. Your customer's staff need to be added to Operate, as Contacts. The contact record needs a PIN Number. The contact record needs a valid email address. The record needs to be assigned to a Location which has at least one allocated printer. The contact person uses an Ezeep printer through the www.ezeep.com website or their Desktop app and DOES NOT use the printer to physically initiate a print, scan or copy job. Prints initiated directly with the printer will not be charged since they do not go through Ezeep. Please see Ezeep's tutorials on Printing from Windows and Mac OSX for an overview of the printing process. Following the steps described in these videos means your users meet their side of the requirements for correct charging and free pages/credits allocation. If the print job is within the allocated pages quota, the charged amount will be set to 0 and the number of printed pages will be deducted from the Account record. The Remaining Pages field will adjust to show the number of remaining free pages, after this charge has gone through. If the print job is partially over quota, Operate will charge for the number of pages that go over the quota and price the free pages as 0. The number of remaining pages on the account will now be 0. If the print job will be fully over quota, then a charge sheet will be generated, to charge the entire cost of the prints, according to the price set on the Product record used for Black and White, as well as Color prints. If you add a manual charge sheet for the Product records used for Ezeep printing, Operate will charge for the print even if there are allocated pages available. This is because the charge did not go through a normal Ezeep process. If you want to keep track of a print and provide it for free, you can set the charge sheet to 0. Charge sheets that are automatically generated via Ezeep can be edited and adjusted, just like any other Operate Charge Sheet. Please see Using Charge Sheets in essensys Operate for further information on this topic. Ezeep allocates free prints within a calendar month and does not split this according to specific billing periods. Therefore, the Operate Bill Run will not take into account how many allocated pages a customer has per month and will bill whichever number has been used within the billing period you select. For example, let's take a new customer that has 20 allocated pages and you bill them on the 15th of the month, but they have only used 5 pages from the 1st of the month to the bill day. They will have 15 remaining pages, which they use up until the 30th of the month. Fron the 1st to the 15th of the next month, they use up their entire quota of 20 pages. When you bill from 15th to 15th, the Bill run will invoice 35 free pages, not just their allocation of 20. If you need your invoices to consistently match the quota every month, we recommend billing printing per calendar month (1st to 30th/31st).